In custom resource packs, the "shade" tag does not work when used in an item model. 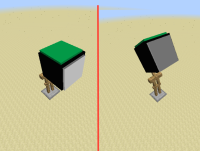 This means that if a block is put on the head of the armor stand and rotated around it will change color quite drastically. MC-103190 "shade": false in the json code is no respected.